I refer to the sales of the “Battle Born Collection” and of the coins listed in the large Rarities Night catalogue as being two different events, although both occurred in the same room on the same night. As the Rarities Night event will be best remembered for the “Just Having Fun Collection” of Standing Liberty Quarters (SLQs), I devote this discussion to quarters, including bust, Barber and Liberty Seated Quarters. In my preview on July 25th, I cited the PCGS Registry Set rankings of the “Just Having Fun Collection” of SLQs. I then noted that an SLQ that is designated as having a ‘Full Head’ (FH) is often worth a tremendous premium over an SLQ of the same date, mint location and certified grade that is not so designated. “In my whole career, I have never seen so many beautiful Standing Liberty Quarters,” Richard Burdick exclaims. 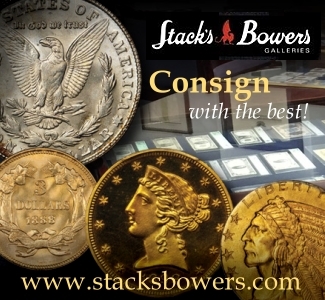 He has been a coin expert and professional coin consultant for nearly fifty years, as well as a collector. Furthermore, Richard has been “regularly attending” major auctions since 1969. Burdick has been deeply involved in the building of some great collections, including the ‘Foxfire’ type set. 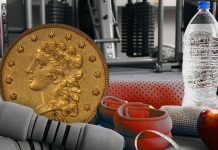 Matt Kleinsteuber declares that it was the “best assemblage of Standing Liberty Quarters in one place that I have ever seen.” Kleinsteuber is the lead grader and trader for NFC coins, and is an instructor at ANA grading seminars. In general, I contend that it is a mistake for a consignor to set a reserve that is at a retail or upper wholesale level. In regards to the Just Having Fun (JHF) SLQs, I will focus more on the qualities of the coins than on the reserves. It is not practical to address the entire JHF set here. Before analyzing the results for some of the more important SLQs in the JHF Collection, I discuss quarters of other types, selections dating from 1796 to 1895. SLQs were minted from 1916 to 1930. 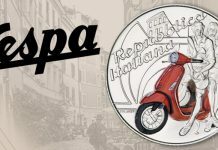 One-year type coins have a special place in coin collecting realms. For one year only, Draped Bust obverse, Small Eagle reverse quarters were minted and 1796 was the first year that U.S. quarters were struck. There were three 1796 quarters in this Rarities Night event. The first is said by the experts at the NGC to be not gradable and to have the “details” of a Fine grade coin. It sold for $11,500, which is about a retail price for a gradable Good-06 1796 quarter. This is a moderate price, in my view. I have seen many ungradable 1796 quarter that are in far worse shape than this coin. It is not bad. The russet toning is natural. The second is PCGS graded VG-10. While several, very noticeable gashes are shallow, these are moderately wide . In my view, this coin should sell at a discount to the prevailing market levels for a PCGS graded VG-10 1796 quarter. It did not, however, sell at a discount. The price realized of $17,625 is strong, well within the retail range. The third did not sell because of a poorly reasoned reserve. A bid of at least $10,450 would have been required for a scratched and heavily cleaned coin that has “VG Details.” If it had been offered unreserved, then I would have expected a price in the range of $5000 to $7500. Among Capped Bust Quarters, the 1823/2 overdate is the key business strike. Steve Tompkins, Rory Rea and other quarter researchers have concluded that 31 are known. The one in this auction is PCGS graded Good-06. It was, almost a year earlier, in the Stack’s-Bowers Rarities Night event of Aug. 18, 2011. On Aug. 24, 2011, my review stated that “the $43,125 result is strong and would be a fair retail price.” This time, on Aug. 9, 2012, it sold for $34,500, a weak to moderate price. On average, coins that are fresh tend to bring higher prices than those that have been recently offered in the mainstream of coin markets. 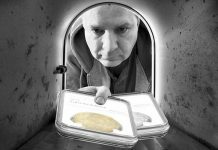 A coin is fresh if it has been ‘off the market,’ not very publicly offered, for five or more years. 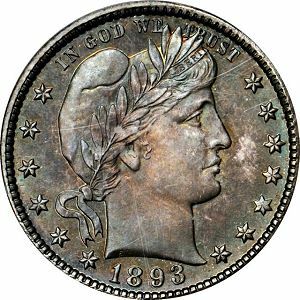 The second type of Capped Bust Quarters is often referred to as “Small Letters” or as “Reduced Size.” The designs, however, are different in an artistic sense, more so than in size. The ‘Small’ 1831 issue is not rare and is often chosen as a type coin to represent the second type of Capped Bust Quarters. The 1831 in this event is PCGS graded MS-65 and is approved by the CAC. It is an excellent coin overall. The toning is definitely natural with gray, russet, green, orange-russet and tan colors. There are, more or less, the same colors on both sides, though these are lighter on the obverse (front). Plus, this coin has very few contact marks. The reserve was such that at least $21,850 would have been required to buy this 1831 quarter. This is not a sound reserve. 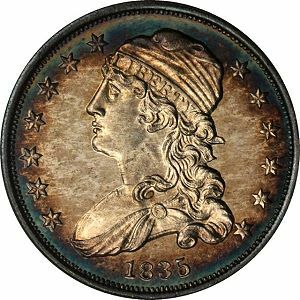 Heritage auctioned this exact same coin, in the same ‘green label’ PCGS holder, in August 2010 for $18,400, which was at least a moderate price at the time. It did not then have a CAC sticker. Relevant market levels in general were probably a little higher in August 2010 than in August 2012. So, the current consignor was requiring a strong price just to start a contest for this coin. It would have made more sense to start the bidding at a substantially lower level. It was great to examine a Proof Capped Bust Quarter that I have never seen before, especially a high quality one. Proof Capped Bust Quarters, in terms of the whole design type, are very rare. Plus, these are among my favorite coins. 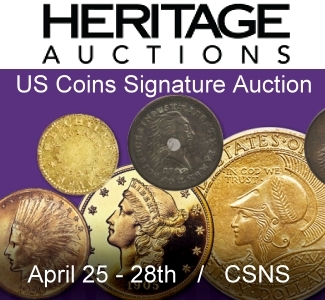 The Proof in this sale is an 1835 that is NGC certified Proof-64 and is CAC approved. It is (or was) in an NGC holder that is probably more than fifteen years old. Rory Rea regards it as “a new and previously undocumented” Proof that brings the “current census to a total of seven” Proof 1835 quarters. Rea is the lead author of a recent book on bust quarters. Rea makes clear that, in his view, it is not the “Proof” 1835 quarter that Rarcoa offered in 1982 and Lester Merkin earlier offered in 1971. This 1835 is an excellent coin. The detail is even better than that found on quite a few other Proof Capped Bust Quarters. It exhibits complete mirrors, though these are a little less glossy than typical Proof mirrors. The fields within the shield are fully mirrored, which is a significant piece of evidence when determining the Proof status of a coin, though it is not conclusive. 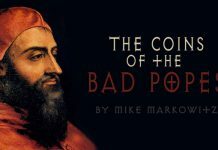 There is no one characteristic that demonstrates the Proof status of a coin. Enough of the outer design elements and dentils are defined in such a way that these have different relationships with the fields than corresponding devices would have on business strikes. I hypothesize that that this quarter was struck twice. It was certainly struck with fully polished dies on a select, smooth planchet (prepared blank). This Proof 1835 was lightly dipped long ago. It has naturally and nicely retoned. Indeed, the toning is even and there are concentric circles in the outer fields. Green-blue peripheral toning complements blue outer fields and russet outer design elements. Shades of russet neatly fade into mostly gray inner fields. I find this coin to be particularly attractive, and probably undergraded. Matt Kleinsteuber seems certain that it is undergraded. It would “very easily” certify as “Proof-65 or -65+,” he asserts. Matt finds this Proof quarter to be “gorgeous”! The 1838 in this Rarities Night is even better than the 1831. It is also PCGS graded MS-65 with a CAC sticker. It is more than very attractive with hardly any contact marks. The mellow toning is mostly gray, with neat russet, green and blue tints. There are touches of orange-russet and yellow colors, especially near the rims. It is really a wonderful coin. Long after I wrote my notes about this coin, Burdick indicated that he agrees, “pretty nice, a better date in gem. [This 1838 has] great natural toning, one of the nicer coins in the auction. If I needed it for a set, I would have bid very competitively for it,” Richard declares. 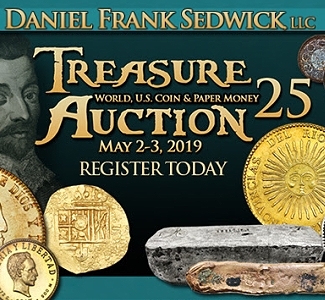 The reserve called for a commitment to pay at least $33,350, which deterred bidders, probably even those who would been willing to pay more than $33,350. In effect, the consignor would only accept bids that constituted strong prices. 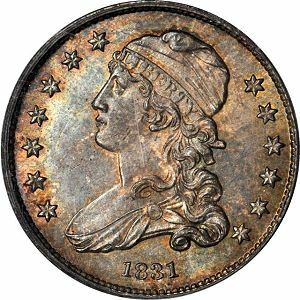 The Liberty Seated Quarters in this sale are primarily of interest to those who collect these ‘by date’ (and Mint location). The San Francisco issues of the 1860s, however, are rarer than most collectors realize and, potentially, many collectors may buy them for a variety of reasons. Some collectors never build sets and just like to own rarities. The 1859-S is a key date. The one in this auction is PCGS graded AU-50. A commitment of $16,100 or more would have been required to buy it, which is just too high a starting point, a strong to very strong price. I like this coin. It is clearly superior to at least one other 1859-S that is also PCGS graded AU-50. The PCGS graded MS-66 1865-S and the PCGS graded MS-6s 1867-S quarters in this auction really require separate discussions. The 1865-S is rare overall and extremely rare in ‘MS’ grades. The 1867-S is even rarer overall and in ‘MS’ grades. Neither of these sold, yet the coins themselves and their corresponding market values are particularly difficult to evaluate. For the PCGS graded MS-66 1865-S, a bid of well over $50,000 would have been required to purchase it. The 1868-S is rare, too, at least gradable pieces are certainly rare. The 1868-S in this sale is PCGS graded MS-64. The reserve of over $16,000 was unreasonable. 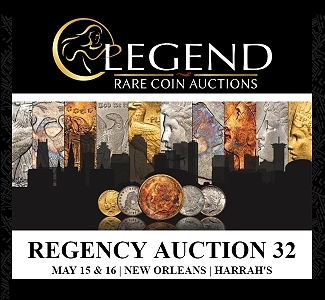 For this coin, an auction price of $13,000 would be moderate. 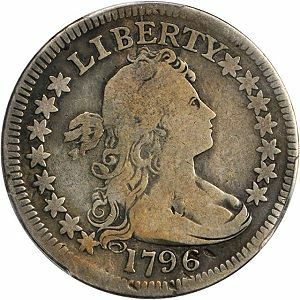 Rare date Liberty Seated Quarters are undervalued in general, from a logical perspective. As for the NGC graded VF-20 1870-CC, I discussed it in July. The reserve, which called for a bid of more than $28,000, was not sensible. The PCGS graded “MS-66” 1871-S brought a strong price, $35,938. It has a CAC sticker. The Eliasberg 1872-S was also offered by Stack’s Bowers in the first Rarities Night event, which was held on Aug. 18, 2011. It is NGC graded “MS-63.” It brought $20,700 in Aug. 2011 and failed to bring as much as $22,425 in Aug. 2012. In my view, the market value for this coin did not rise over the past twelve months. Any 1893-O quarter in a gem grade is an important condition rarity. The one in this sale is PCGS graded MS-66 and is CAC approved. This is a fabulous coin. This 1893-O has pleasant russet, blue and green tones, along with other colors. Indeed, this coin is more than very attractive. Moreover, it is very sharply struck and has reflective fields. The strike could even be special, many of the devices are especially crisp and markedly defined. I probably understand the reasons why the consignor figures that this 1893-O is worth more than $9000. Even so, many Internet bidders would be likely to value the ‘holder,’ the certification, at less than $5000, maybe not even above $4000. Someone would have to view the coin in actuality, with magnification, and have a deep understanding of 19th century silver coins, to really appreciate the neat aspects of this 1893-O quarter. 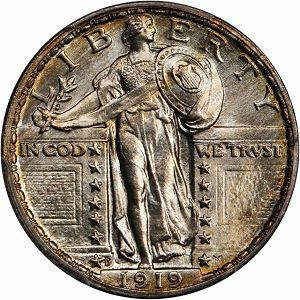 The pretty Standing Liberty Quarters in the JHF set notwithstanding, this is one of my favorite quarters in this auction. The 1895-S quarter in this auction is PCGS graded MS-67. It sold for $12,132 in the Stack’s-Bowers March 2012 Rarities Night event and failed to sell for a similar amount this time. It also did not sell in the Stack’s-Bowers March 2011 auction in Baltimore. It did sell, though, for $12,075 in April 2009 when Heritage auctioned it as part of the “Joseph Thomas” Collection. Contact marks, scuff and medium scratches on the face are all readily apparent. The contact marks on the nose alone may preclude a true 67 grade. Clusters of hairlines plus a few medium horizontal scratches on the face and neck are problematic. Though it has been dipped multiple times, it has been naturally retoning to some extent. It looked better in July than it did in March, in my opinion. Some uneven darker areas of toning that survived more than one dip, however, seem a little awkward. Also, there is a bothersome indentation near the neck in the field, not far from the last obverse star. Some experts might feel these imperfections may be allowable on a very attractive coin that is graded MS-65, but not on one that is graded MS-67! The certified Proof-68 Barber Quarters in this sale would really require a separate discussion. Markets and grading criteria for these would need to be analyzed to effectively discuss auction prices. Demand for Proof silver type coins from the 1860 to 1916 era seems to have lessened a little in 2012. The keys to the SLQ series are the 1916, the 1918/7-S and, to a lesser extent, the 1927-S. The Just Having Fun Collection (JHF) 1916 is one of the four highest certified by the PCGS, ‘MS-67 Full Head.’ It went for $138,000, a moderate to strong price. Richard Burdick asserts that “I seldom see a well struck 1916. I have never seen a true Full Head 1916 quarter. I have been looking at them for over fifty years.” Indeed, Richard collected SLQs as a kid. 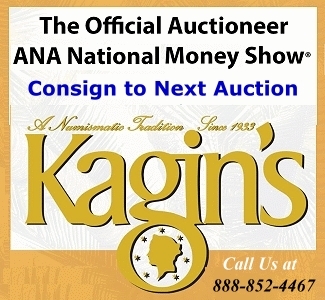 Since 1969, he has attended almost every auction that includes a major offering of SLQs. My interpretation of this coin is different from that of Richard and Matt. While the reverse is very attractive, I did not find the the toning on the obverse to be as appealing as Richard or Matt did. Moreover, this coin has many contact marks and other imperfections such as the sizeable gash on the eagle’s wing above of the eagle’s head. The eagle’s torso could have been a little more sharply struck. Importantly, there are a significant number of other contact marks on the eagle and in the nearby fields. There are even more contact marks on the obverse, along with a few U.S. Mint caused imperfections. I noticed indentations on the shield right away. There are some on the ribbon, stomach and legs, not all of which are apparent in the catalogue images. For positive and negative reasons, this is a coin that really should be carefully viewed in actuality. Contact marks on the left portion of the ribbon seem bigger in actuality than they do in pictures. I would be surprised if this coin ever receives a sticker from the CAC while in a holder with a “MS-67“ grade. The $138,000 result was strong. Type One SLQs are of a notably different design, and were minted just in 1916 and 1917. 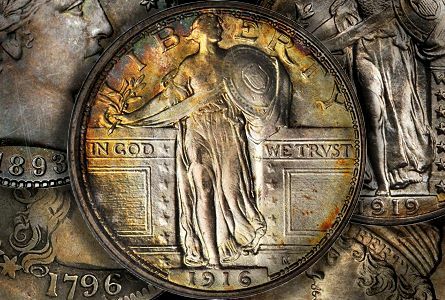 The Just Having Fun (JHF) 1917-D is PCGS certified ‘MS-67+ Full Head’ and is CAC approved. There is doubt that this coin merits a full head designation. Burdick concludes that it has “100% Full Head”! The shield has exceptional detail as well. Moreover, this coin is extremely attractive. It certainly has the eye appeal of a 67+ or a 68 grade coin. 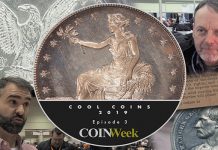 Note that a CAC sticker on a coin with a PCGS or NGC certified plus grade does not imply that experts at the CAC are in agreement with the plus aspect of the already certified grade. If this coin was PCGS or NGC graded MS-67, rather than 67+, it would have still received a CAC sticker. Experts at the CAC will not reveal whether they regard this coin’s grade as being in the ‘high end’ or in the ‘middle’ of the 67 range. In any event, this is a fantastic coin. It looks much better in actuality than it appears in catalogue images. This 1917-D went for $23,000. Although this is a very strong price, I was not surprised. There was another highly certified Type One 1917-D in this sale. It was not part of the JHF Collection. It is NGC certified ‘MS-68* FH’ and it has a CAC sticker. This same coin was auctioned by Heritage for $29,900 in August 2010. The Simpson name then appeared on the NGC holder. It did not sell in 2012. A bid of at least $37,375 would have been required to buy it. I prefer the JHF Type One 1917-D SLQ. The 1918/7-S is one of the keys to the series of SLQs. Among those with a ‘Full Head’ designation, the highest grade assigned by the PCGS to an 1918/7-S overdate is ‘MS-64+,’ this coin. Indeed, the lone PCGS certified MS-64+ 1918/7-S was in the JHF Collection. The JHF 1918/7-S brought $253,000, a strong price. True ‘Full Head’ 1919-D quarters are extremely rare. The head and shield detail on the JHF 1919-D is astounding. It is the best struck 1919-D quarter that I have ever seen. It is the only 1919-D that is PCGS certified ‘MS-67 FH.’ Burdick finds it to have a“100% Full Head” and he agrees with the assigned 67 grade. The head and the shield on the JHF 1919-D are certainly more detailed than the head and the shield on the Lull-Malibu 1919-D that Spectrum-B&M auctioned in Nov. 2010, for $109,250. The Lull-Malibu 1919-D is PCGS certified ‘MS-66+ FH’ and is the second highest certified by the PCGS. The $149,500 price that the JHF 1919-D brought is strong. 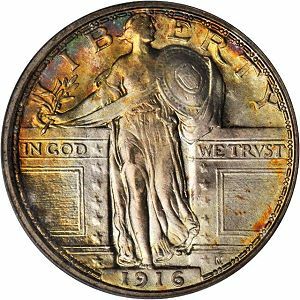 The JHF 1919-D certainly has more eye appeal, though, than the just mentioned PCGS certified ‘MS-66+ FH’ Lull-Malibu 1919-D. I like the blue and russet tones on the JHF coin, though it is really the exceptional detail that I found to be overwhelming, not this coin’s colors. 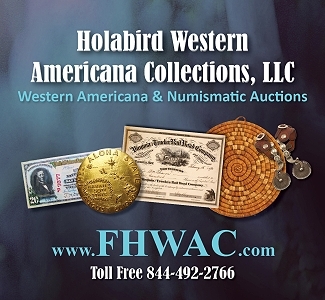 The JHF 1920 is more attractive in actuality than it appears online or in the physical catalogue. It is very attractive to extremely attractive. Does a more attractive 1920 exist? “I don’t think I will ever see another 1920 like this in my lifetime,” Burdick states. The JHF 1920 is PCGS certified ‘MS-67+ FH’ and is CAC approved. By Dec. 2011, the PCGS had certified four as ‘MS-67 FH’ and none higher. So, it is likely that this coin upgraded from ‘MS-67 FH’ to ‘MS-67+ FH’ in 2012. 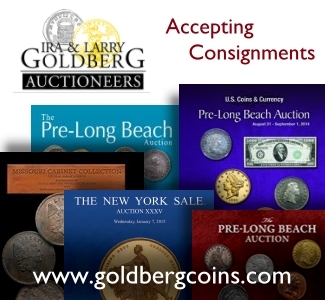 Not long ago, the consignor brought his SLQs to be re-evaluated by the PCGS and to be placed in PCGS SecurePlus holders. 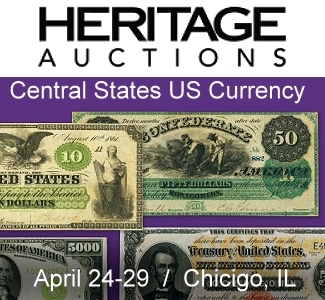 In Jan. 2012, Heritage auctioned a PCGS certified ‘MS-67 FH’ 1920, which has a little sharper head, though not as desirable in some other ways as the JHF 1920. That one, from the “North Shore Registry Collection,” realized $40,250. The JHF 1920-D received a good deal of attention. The 1920 Denver Mint issue is scarcer than the 1920 Philadelphia Mint issue. The JHF 1920-D is PCGS certified ‘MS-68+’ and it has a CAC sticker. It seems to have sold for $207,000. I find this to be a very strong price. Richard Burdick agrees. The JHF 1921 is PCGS certified ‘MS-67 FH’ and is CAC approved. It went for $69,000, a very strong price. “A lot of money for this coin,” Burdick, though, finds that it has a “100% Full Head” and he likes the coin. Before the auction, the PCGS price guide value was $52,500. 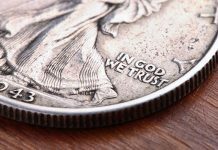 The Numismedia retail value is or was $33,130, which pertains more to NGC certified coins than to PCGS certified coins. I figure a retail value of around $60,000. A discussion of a set of SLQs would be inadequate without mention of a 1927-S. The primary 1927-S in the JHF Collection is not designated as having a Full Head (FH). In my opinion, an SLQ with at least two-thirds of a head is often a much better value for collectors than an SLQ of the same date and of very similar quality that is FH designated. In any case, this 1927-S has around two-thirds of a head and it is great coin. Indeed, the colorful toning is definitely natural and this is one of the most attractive coins in this set. This JHF 1927-S is PCGS graded ‘MS-67+’ and is CAC approved. In my view its grade is around the border of a 67 and a 67+, meaning its grade is in the middle to ‘high end’ of the 67 range. Richard finds that it grades 67, not 67+. A 1927-S quarter that is PCGS graded MS-66 and designated as having a full head would have a retail value of more than $200,000. The PCGS has not certified a 1927-S as ‘MS-67 FH.’ The Malibu 1927-S is PCGS certified ‘MS-65+ FH’ and it sold for $149,500 in Nov. 2010. The JHF 1927-S is of higher quality than the Malibu 1927-S. It failed to meet its reserve, which would have required a commitment of at least $34,500. Matt Kleinsteuber suggests that, had there been no reserve, “this 1927-S would probably have sold for $34,500 or more. 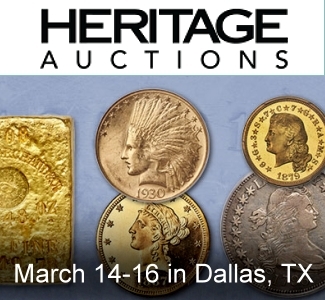 No one wanted to be the first bidder at this level.” Matt very much likes this coin, as do I. People who seek high quality type coins often seek especially attractive representatives of the least scarce dates in a series. Someone who is purchasing just two or three SLQs for a type set need not buy a better date. My favorite type coin in the JHF Collection is the 1928 that is PCGS certified ‘MS-67+ FH’ and is CAC approved. This is another JHF quarter that upgraded from 67 to 67+ in 2012. This upgrade was deserved. This coin is extremely attractive and wonderful overall. In my view, its grade is not far from the MS-68 range. It is a tremendous coin. The next lot, a JHF duplicate, was a 1928 quarter that is PCGS certified ‘MS-66+ FH’ and is CAC approved. 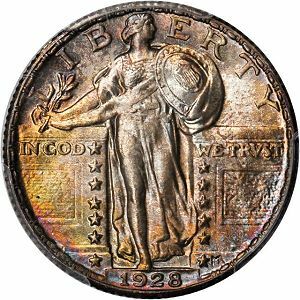 This lesser grade 1928 sold for $7638. Is the better 1928 worth a premium of more than $35,000? 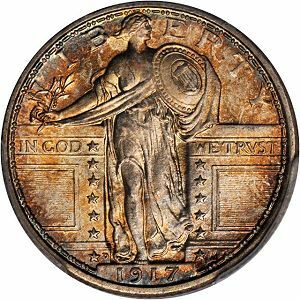 Though I like this JHF 1928 more than any of the other type coins in the JHF set, Richard Burdick is enthralled with the JHF 1930-S in the JHF Collection. It is PCGS certified ‘MS-67 FH’ and is CAC approved. This 1930-S does have terrific green toning. Burdick also emphasizes the exceptional “symmetry” of the toning. We agree that it was probably stored in a Wayte Raymond National Coin Album, a kind that was popular for decades. It is much more fully toned, though, than most SLQs that were stored in the same brand of albums. I wonder if I will ever again see SLQs that are as stunning as those in this Rarities Night event.